All of the heroes of the Lands of the Accord are slain in a single night. War resurfaces, the land is thrown into turmoil, and the storm is approaching. 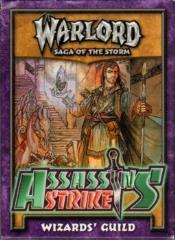 Assassins’ Strike Guild masters decks include 2 each of 4 decks. Each of the 4 decks feature one of the Accord Lands Guild masters. These Warlords hold so much power as the Guild master of their respective class (Fighter, Mage, Cleric or Rogue) that characters from different factions of the same class will join them in battle. Starter deck with 50 cards.